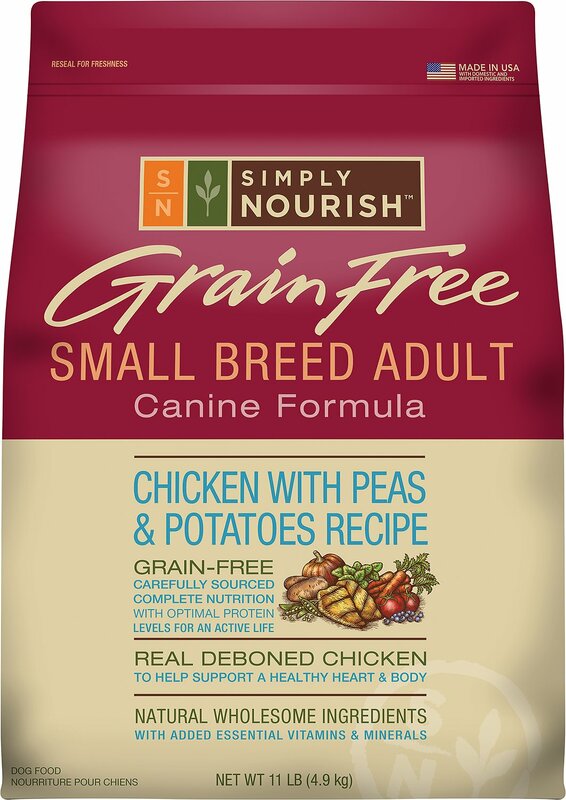 Feed your best friend the nutrition he deserves with Simply Nourish Grain-Free Chicken with Peas & Potatoes. This small breed recipe is made without grains, soy or gluten, which makes it paw-sitively perfect for pups with food sensitivities. This easily digestible and highly nutritious formula helps support healthy skin, a shiny coat and a strong, lean body. Best of all, it includes a superfood blend of real fruits and vegetables like carrots, spinach, sweet potato, pumpkin and blueberries for a deliciously complete and balanced meal that's also filled with antioxidants. 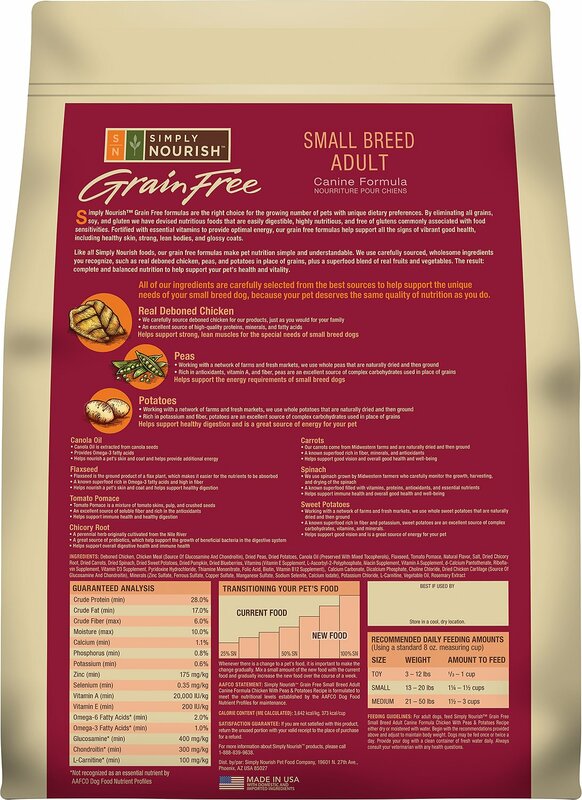 Plus, this adult kibble has added vitamins and minerals to support your pet's health, vitality and longevity! Small breed kibble made with deboned chicken and chicken meal for a nutritious source of protein. Adult dry dog food with a natural source of glucosamine and chondroitin for healthy joints, plus flaxseed for a good source of omega-3 fatty acids. Grain-free meal made with peas and potatoes for healthy carbohydrates that will keep your pal full for hours. Includes real vegetables and fruits for a complete and balanced meal your dog deserves. Contains added vitamins and minerals to support your dog’s overall health and well-being. 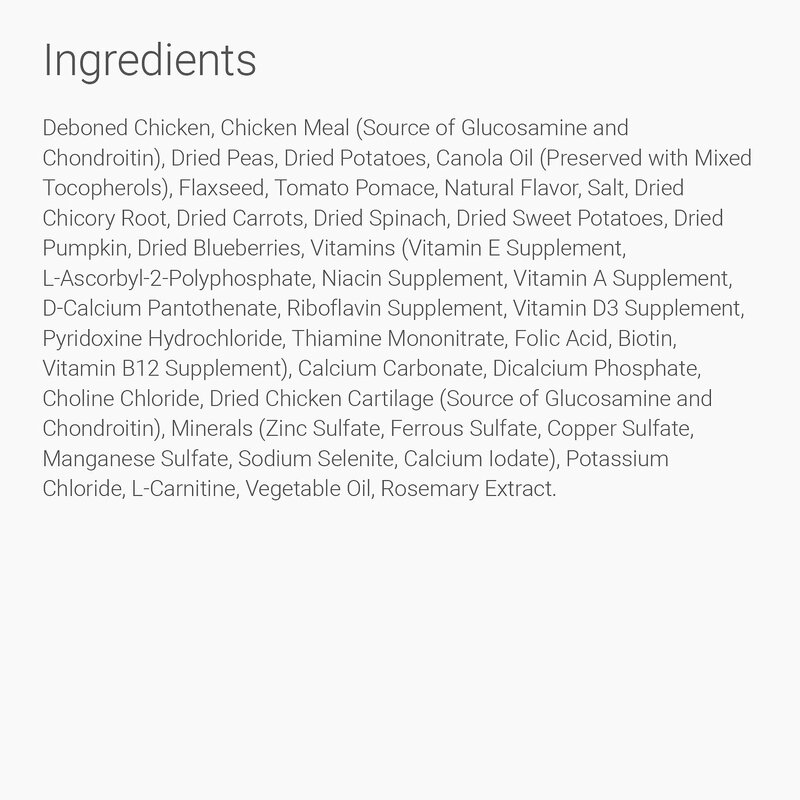 Deboned Chicken, Chicken Meal (Source of Glucosamine And Chondroitin), Dried Peas, Dried Potatoes, Canola Oil (Preserved with Mixed Tocopherols), Flaxseed, Tomato Pomace, Natural Flavor, Salt, Dried Chicory Root, Dried Carrots, Dried Spinach, Dried Sweet Potatoes, Dried Pumpkin, Dried Blueberries, Vitamins (Vitamin E Supplement, L-Ascorbyl-2-Polyphosphate, Niacin Supplement, Vitamin A Supplement, d-Calcium Pantothenate, Riboflavin Supplement, Vitamin D3 Supplement, Pyridoxine Hydrochloride, Thiamine Mononitrate, Folic Acid, Biotin, Vitamin B12 Supplement), Calcium Carbonate, Dicalcium Phosphate, Choline Chloride, Dried Chicken Cartilage (Source of Glucosamine And Chondroitin), Minerals (Zinc Sulfate, Ferrous Sulfate, Copper Sulfate, Manganese Sulfate, Sodium Selenite, Calcium Iodate), Potassium Chloride, L-Carnitine, Vegetable Oil, Rosemary Extract. my little boston mix LOVES this food! She seems to keep a stable weight on it and she likes more than other foods we tried. Its great that it is grain free! This buy was the best one ever for pets, like chewy a lot.